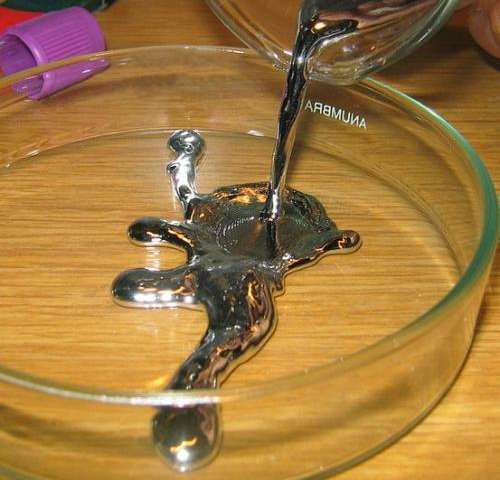 Element mercury (Hg), liquid form. Credit: Wikipedia. Mercury is a complex, multifaceted contaminant which can take many different forms. It is poisonous to humans and wildlife and damaging to the environment. Currently, around two thirds of the mercury entering the environment comes from current or legacy human sources including mining, industrial activities, coal combustion and incinerators, with the remaining originating from natural sources. A special issue addressing the most up-to-date science on the fate and effects of mercury has now been published in Springer's journal Ambio. Methylmercury is the most toxic form of mercury. The main exposure route for methylmercury to humans and wildlife is through the consumption of fish and shellfish. Exposure to inorganic mercury also occurs through industrial and mining processes and religious and ethnic practices. Mercury exposure can impair the health of humans and wildlife by damaging neurological, developmental and reproductive functions, and negatively affecting the immune and renal system. Therefore, the global health risks to humans and wildlife that result from exposure to this toxin are significant, especially in populations that depend on fish for subsistence. i)	How is the global mercury cycle changing in response to perturbations such as climate change? ii)	How is the cycling and bioaccumulation of mercury changing in specific places in response to perturbations like climate change or urbanization? iii)	What is the relative risk of mercury exposure to human and wildlife health in the context of other risks/stressors? iv)	How can scientific knowledge contribute to the implementation and effectiveness evaluation of the global treaty on mercury, known as the Minamata Convention? Scientific understanding of the transport and fate of mercury in the environment and risk to human and wildlife health has increased markedly in recent years. The international treaty to control and mitigate mercury emissions and releases to limit exposure, the Minamata Convention, has been ratified by 84 nations and entered into force. Therefore it is timely to translate and synthesize the science of mercury for policymakers so that decisions made under the Convention and other regional and national efforts are based on the most rigorous scientific understanding. This special issue represents the latest results from international mercury science and policy communities and will provide a basis in the coming years for developing policy to minimize environmental effects and exposure to this contaminant. Supposedly the ADA was scheduled to announce a ban on dental mercury by 2020. This in combination with a newly created position of dental aide to work exclusively on the impoverished low income people now missing out from dental care.